Not to be confused with Kings, a district in Liberty City in Grand Theft Auto 1. The King's district of San Fierro. 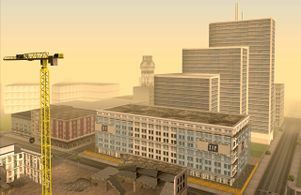 King's is a district of San Fierro, San Andreas that lies essentially at the heart of the city, with Downtown and Calton Heights to the north, Easter Basin to the east, Doherty and Garcia to the south, and Queens to the west. The name King's (note the apostrophe) is a foil to the tongue-in-cheek name of its neighbor, Queens, which is San Fierro's version of the famous Castro District in San Francisco, sporting gay-friendly street banners and a welcoming atmosphere. King's is modeled after San Francisco's Noe Valley, which is situated just south of the Castro District. Like Noe Valley, King's is a residential/commercial district that is serviced by the cable car system. This district is home to numerous small businesses, all of which are inaccessible to the player. The general atmosphere is one of contentment, but with a modicum of aggressiveness. Members of the San Fierro Rifa, who inhabit the south side of this neighborhood, will occasionally accost the player, making for potentially hazardous situations. Carl Johnson, in a new city with his strange new friend, The Truth, is forced to make a decision: turn the derelict San Fierro garage he won in a street race with Claude and Catalina into a successful chop-shop, or wallow in his own self-pity. With the urging of his sister Kendl and his closest ally from Los Santos, Cesar Vialpando, Carl sets out to find mechanics he can trust. The Truth tells Carl of friends of his in San Fierro that would fit the bill, so the two set out to recruit them. After picking up Jethro in the Xoomer gas station in Easter Basin and then monitoring the movements of a strange van in the San Fierro Medical Center in Santa Flora, Carl and The Truth set off to find Dwaine, who is working at a hot dog stand at the King's cable car station. Dwaine tells them he has loose ends to tie up before meeting them at the garage in Doherty, and the men head off in search of yet another strange van near San Fierro Police Headquarters in Downtown, before finally picking up Zero near his shop in Garcia. This page was last modified on 26 April 2012, at 20:27.